When people ask about psychoanalysis they usually want to know about psychoanalytic treatment. Psychoanalysis is based on the belief that meanings of personal experiences often remain unacknowledged. These unconscious meanings may give form to unhappiness revealed in symptoms, troubling personality traits, recurrent difficulties in work or love relationships, or disturbances in mood and self-esteem. Psychoanalytic treatment helps to bring these unconscious meanings of personal experience to the surface, by linking the person’s current relationships and patterns of behaviour to their historical origins. This permits a person to see how they have changed and developed over time, thereby offering the potential to deal more constructively with their current life. Analysis is an intimate partnership. The bonds established in the course of treatment create a safe environment for self-revelation. Exploration of these bonds also reveals important ways in which difficulties can repeat themselves. A persons negative and positive patterns of relating can emerge in the transference and be worked through. The experience with the analyst is not simply intellectual, but is emotional and spans the range of human expressivity. Continuity of treatment is essential to developing the closeness required for this form of treatment. Typically, meetings with the analyst take place three to five times a week. The person lies on a couch so as to better attend to their internal processes. The person sets their own pace and their own agenda for the treatment by saying everything that comes to mind to the best of their ability. As the person speaks, hints of the unconscious sources of current difficulties gradually begin to make themselves clear through repetitive patterns of behaviour, in the topics which the person finds to talk about, and in the ways the person relates to the analyst. The analyst helps by tending to the evolution of the therapeutic bond. This allows the analyst to make meaningful reflections on the person’s difficulties. With these reflections, the person can refine, correct, reject, and further modify their thoughts and feelings. This requires a working and reworking. Through a collaborative effort with the analyst, the person comes to gain mastery over crippling life patterns or over incapacitating symptoms which helps to expand his or her freedom to work and to love. Change occurs in deep and abiding ways. 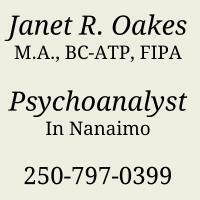 The designation of “psychoanalyst” is not protected by federal or provincial law. It is therefore prudential that before beginning an analysis the practitioner’s credentials should be known. Graduate psychoanalysts trained under the auspices of the Canadian Psychoanalytic Society or other component societies of the International Psychoanalytic Association or trained within a component society of the American Psychoanalytic Association have had very rigorous and extensive clinical education. They must also meet high ethical, psychological, and professional standards. Psychoanalysts may come from a background of medicine, psychology, counselling or social work. Their common ground is, that in addition to their academic degrees they have gone on to obtain psychoanalytic training from a recognized psychoanalytic institute. Interview with Professor Mark Solms, Ph.D., chair of the IPA Research Committee, at the 2013 International Psychoanalytic Conference "Facing the Pain" in Prague, Czech Republic. What does Psychoanalysis contribute to Neuroscience? What did Freud get right and wrong? What are you doing in brain damage research? What is scientifically true of Psychoanalysis? What is difference between Psychoanalysis and Evolutionary Psychology? The best way to discover if psychoanalysis would be of benefit is to seek out a consultation with a psychoanalyst. Psychoanalysis is a highly individual treatment that relies on the person’s innate potential for healing and growth. In some ways, a person must have demonstrated some ability to achieve some important satisfactions in life. Despite such achievements, the person may have significant symptoms which may include: depression or anxiety, sexual incapacities, or physical symptoms without any demonstrable underlying physical cause. The person may be plagued with private rituals or compulsions, or repetitive thoughts. Another may live a constricted life of isolation and loneliness, incapable of feeling close to anyone. A victim of child abuse might suffer from an inability to trust others. The person may be aware of repeated failures in work or in love due to self-destructive patterns of behaviour. Whatever the problem, a thorough evaluation is required to determine if psychoanalysis is properly indicated. The evaluation generally takes place over a series of interviews which allows the person and the analyst some experience of each other within the therapeutic setting. At times, the psychoanalyst may recommend a less intensive format of treatment such as psychoanalytic psychotherapy, marital therapy, or group psychotherapy. See also "The Efficacy of Psychodynamic Psychotherapy"